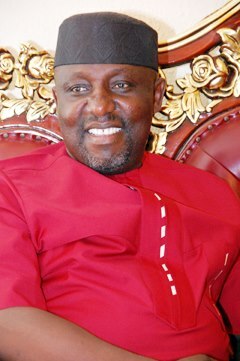 Chairman of All Progressives Congress, APC, Governors Forum, and governor of Imo State, Owelle Rochas Okorocha said yesterday that seven Peoples Democratic Party, PDP, governors were secretly holding meetings and strategizing in favour of his party for the polls. This came as national leader of the party, Asiwaju Bola Tinubu, said the federal government has allegedly diverted money meant to insure security men, especially those fighting insurgency in the North East. Okorocha, who spoke at APC campaign rally in Amuwo-Odofin Local Government Area of Lagos, did not, however, name the PDP governors involved. He said: “Buhari’s victory has been sealed and delivered and today, about seven governors who are not APC are coming to hold meeting with us privately. There is fear in the country and the fear was that they know that Buhari is a good man and he will win. He noted that after Buhari assumed office in 1983, he stopped open defecation before it became entrenched again and eradicated all forms of indiscipline. Okorocha said the glory of the country would be restored because the change that gave rise to APC had started. “PDP died immediately APC was formed and we scheduled the burial of the party for February 14 but they postponed it to March 28. We are waiting patiently to bury the party forever. But let me tell you that you can change the date of burial but you cannot change the burial. It must take place. “The worst thing that can happen to any nation is to have a bad government and the worst thing that can happen to any family is to have a bad father. “Today, it is obvious that PDP is a bad government and we thank God that we came together to change the bad government,” he said. Also speaking at the rally, former governor of Lagos State and a chieftain of APC, Bola Tinubu, lamented that in spite of failing to fulfill promises made to Nigerians in 2011, the Federal Government, under President Goodluck Jonathan, was yet to apologise to Nigerians and explain the reason for the failure. He said: “Jonathan never says to Nigerians, I am sorry. Today, he cannot pay insurance for the life of the soldiers and the police who are working in danger. “They have concentrated money in bribing people. The exchange rate is very high and he says he wants to make vehicles for Nigeria. “Majority of Nigerian youths are looking for jobs. Six years ago, he appealed to Nigerians that he had no shoes and because of that people voted for him. The President has spent six years in office and he is yet to do what he promised Nigerians. While noting that the forthcoming elections was not about religion or ethnicity, Tinubu urged the electorate not to vote on the bases of ethnicity, tribe or religion. “If a government has been there for 16 years and you don’t see progress, you must move out of that government; send them away. Enough is enough. Failure is not part of us. “Our brothers and sisters from East, there is no difference between us. The vote is about salvation, happiness and together in unity; we can rescue Nigeria and lead it to prosperity,” Tinubu said.